A from-the-trenches guide to better vocal auctions. Ready to understand the mystery behind live auctions? In this webinar, you’ll learn the tricks — the marketing, the psychology, and the science — behind a top-performing live auction. From a pre-event time perspective, live auctions are one of the easiest elements to pull off. (It’s true!) But they can become stale, if you don’t know how to energize them. The items we had were good (or so you thought), so WHY didn’t they sell for much? Why do the SAME PEOPLE always bid? Can that be changed? These are common questions from auction organizers. The good news is that there are ways to do this, and you’ll see the improvements in your auction once you start implementing these concepts. What sells for OVER VALUE in the live auction. You’ll be taught the 5 categories you should include in the live auction in order to maintain momentum and keep sales high (which is important in buyer psychology). This is DIFFERENT than what you put in a SILENT AUCTION. You’ll understand the difference between a silent auction procurement versus live … and get the scoop on what’s worth packaging together or not. Real-life examples of how nonprofits use marketing ideas from corporations to improve sales. How to improve bidder interaction! 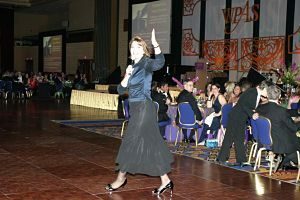 Timing: When to hold the live auction, whether you’re scheduling it around headline entertainment, a silent auction, a buffet dinner, a great band, or another program element. Crowd control: Getting guests (even loud ones) to pay attention and bid. Selecting and training the volunteers you’ll need for the live auction. How to market the live items for maximum sales … including that tricky fair market value. Do you list it, or not? Auctioneer savvy: How to find, hire, and work with an auctioneer, be that a pro or a volunteer. Four templates for fun activities that engage live auction guests. You’ll learn about the games in the course, but the templates themselves are most easily downloaded form this page. Your auction will include a live auction for the first time. Your live auction is stale. Bidding in general has declined. Your live auction has the same predictable bidders; you want ideas on engaging others. You would prefer if all guests — whether they bid or not — are somehow involved during the auction. Your live auction is primarily volunteer-run. This training is the easiest way to bring newbies up to speed. Use it annually to educate your team. Preferably watch it as a team, or at least ask each member of your committee to watch the DVD on their own time. Benefit auctioneer Sherry Truhlar helps charities across the USA, averaging more than one benefit auction per week. 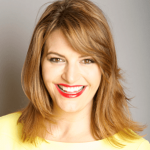 Dozens of other clients are supported annually through consulting, and she’s taught thousands of people through her auction webinars. As a busy benefit auctioneer with clients in multiple states, she bring her expertise to you based on extensive number crunching, observations, testing, and tweaking in her own auctions from California to Washington, D.C. … New Hampshire to Florida … Wisconsin to Texas. She teaches auction planners how to incorporate new ideas into what can become a stagnant part of the evening. 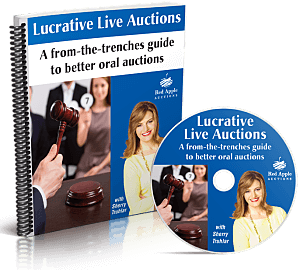 As an expert teacher and national educator on all-things benefit auction oriented, this webinar provides all the tools necessary to lay a solid foundation for delivering an engaging and profitable live auction.